Shanghai Foxtrot extols the romance and tragic decadence of Old Shanghai with classic Chinese songs from the 1920s, 30s, 40s, and 50s. Shanghai in the 1930s was known as both the “Paris of the East” and the “Whore of Asia” for its cosmopolitan and decadent qualities. This show delivers a taste of the glamor and extravagance of the time, featuring live performances by tango star Anton Gazenbeek, burlesque sensation Calamity Chang, and the beautiful Maggie Moon. Live music performances by the Shanghai Foxtrot band will be a combination of popular Western and Chinese jazz, featuring songstress Shien Lee. A flash from the past! 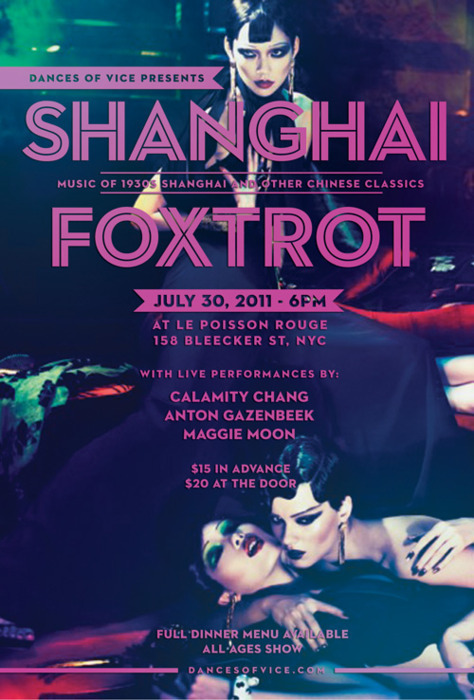 Photos from the first ever Shanghai Foxtrot show at Dances of Vice: Shanghai Vice at The Montauk Club, on July 5th, 2008, by Steven Rosen. 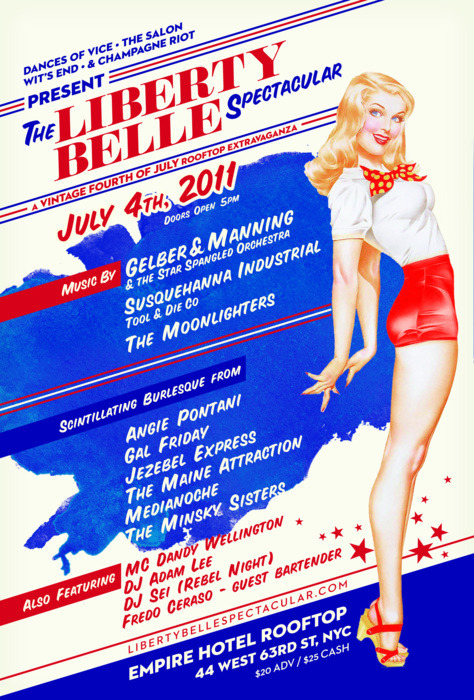 Join us on the rooftop of the lavish Empire Hotel, featuring live music, burlesque, dancing, fireworks, and delicious cocktails under the stars! Dances of Vice once again pays tribute to classic American cartoons of the 1920s, 30s, and 40s at The Highline Ballroom with POWERHOUSE STOMP II, featuring live big band cartoon music and hot jazz by Brian Carpenter’s Ghost Train Orchestra! Brian Carpenter’s Ghost Train Orchestra performs unearthed music mined from the dusty vaults of a basement record collection, new arrangements of “voodoo music” and spirited stomps from the most incredible of the late 1920s Chicago and Harlem jazz bands. Their debut album “Hothouse Stomp” was released this spring on Accurate Records. 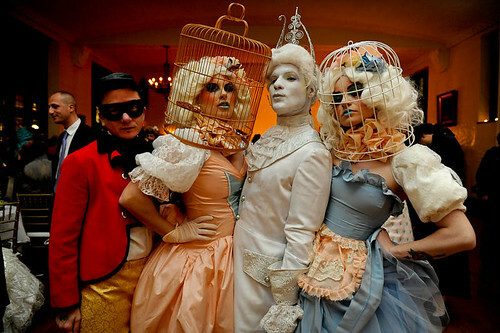 * Classic Cartoon Costume Contest at 10PM! Metromix just posted the Best of Dances of Vice Metromix Retrospective featuring their favorite DOV events throughout the years. A lovely retrospective before our fourth anniversary! New Wave and New Romantic lovers also won’t want to miss the sixth installment of Oh! 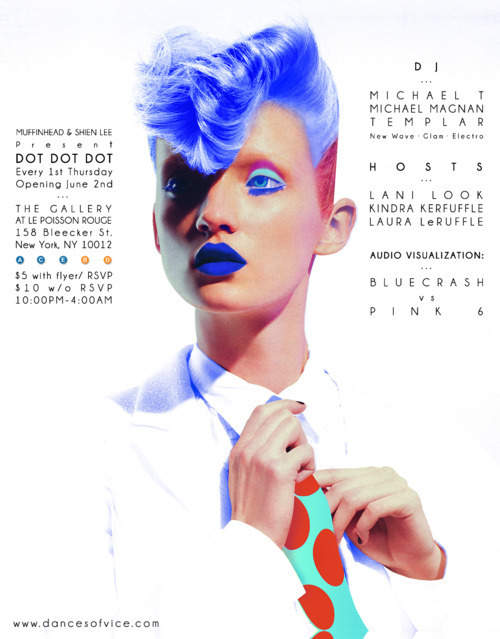 You Pretty Things this Sunday at Le Poisson Rouge! IMPORTANT NEWS: THIS EVENT HAS BEEN MOVED TO LE POISSON ROUGE AT 158 BLEECKER ST! DOORS OPEN AT 10PM! 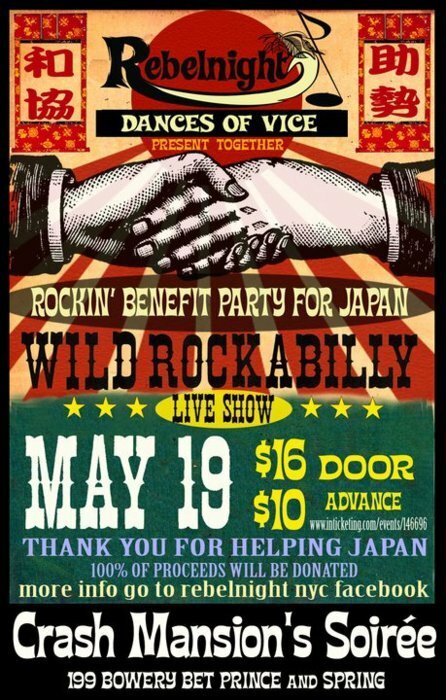 Rebel Night and Dances of Vice present a Rockin’ Benefit for Japan on May 19th at LE POISSON ROUGE, featuring wild live rockabilly by Eddie Clendening and The Blue Ribbon Boys (from the hit Broadway show Million Dollar Quartet), Rhythm Bound (NYC Rockabilly), Baxx SiSi’s (Japanese Rock ‘N Roll band), cabaret by Hula Hoop Harlot and Host DJs from Rebel Night, DJ Sei and DJ Jun. Thank you for supporting Japan! 100% of proceeds will be donated to The Japan Society.